Q. In regards to personality conflicts with an account, at what point do you walk away and let someone else in your organization try? A. Great question. Let me answer in two ways. First, from a purely theoretical perspective, a professional sales person should be able to build relationships with anyone, regardless of the personalities involved. So, from a theoretical point of view the answer would be “never.” It is the responsibility of the sales person to figure out how to sell to every account, and every person within the account. There are some selling situations where this “theoretical” position becomes part of the practical expectations for a sales person. Large geographical territories, for example, don’t allow for the option of letting someone else try. Having said that, let’s recognize that there are very few sales people in the world who are analytical enough, creative enough, motivated enough and flexible enough to figure out how to sell to every account. So, we’re back to your question. I don’t think there has ever been any research on this, so my answer comes from my personal experience. A large part of the answer depends on the company’s position in the marketplace, their strategies, and the availability of a capable “someone else.” For example, if you have a hot new product with a limited window of opportunity, that would shorten the amount of time that a company could wait for a sales person to successfully penetrate an account. In a mature market, where competitors were jostling for business from one another, that could lengthen the time a company could wait. The same is true for a capable option. If you have no capable person prepared to take over the account, the time frame expands. If you have a good person chomping at the bit, that influences your calculations in the opposite direction. With all that said, my gut feeling is a year or two. It’s going to take at least a good year to exhaust all the possible strategies for penetrating the account. And there is no use changing the account until the current sales person has given it his/her best shot. So, at least a year, maybe two. If there is no progress at that point, nor any sign of imminent changes, it’s time to make a change. 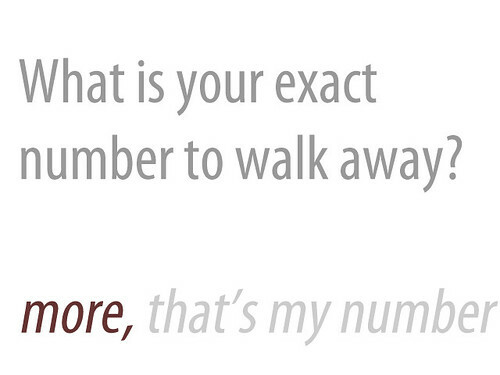 Image “What is your number to walk away” by Satya Murthy on Flickr under Creative Commons license. Dave Kahle is one of the world’s leadng sales educators. He’s written nine books, presented in 47 states and eight countries, and has helped enrich tens of thousands of sales people and transform hundreds of sales organizations. Sign up for his free weekly Ezine, and visit his blog. For a limited time, receive $547 of free bonuses with the purchase of his latest book, How to Sell Anything to Anyone Anytime.